These days, the stage is overwhelmed with young performers hoping to make it big. But there’s something you’ve probably noticed: Seniors aren’t represented as prominently, which is a crying shame. But now, ‘The Voice’ is changing all of that with ‘The Voice Senior’ — a talent competition exclusively for the seniors. Contestants must be at least 60 years of age or older in order to compete. This is truly an idea whose time has finally come, and everyone all over the world is tuning in. “The Voice Senior” couldn’t have come at a better time for Jimi Bellmartin. The sixty-nine-year-old soul-singer received the most votes and was crowned winner and champion of Season 1 of The Voice Senior, and when you hear him sing, you’ll understand why. About five words into his song, Jimi does such a fantastic job channeling James Brown, the late Godfather of Soul, that all the judges hit their buzzers, turning their chairs around, signaling they wanted him on their team. Meanwhile, Jimi’s family was watching on a monitor backstage. They surely knew he was good, but even so, they’re entirely stunned when the coaches turn around so early in the performance. We’ve posted a video of Jimi’s incredible performance so you can see (and hear) for yourself. For his audition song, the sixty-nine-year-old singer chose ‘It’s A Man’s Man’s Man’s World” by James Brown and Betty Jean Newsome. Brown recorded it on February 16, 1966 and released it as a single later that year. It reached No. 1 on the Billboard R&B chart and No. 8 on the Billboard Hot 100. Its title is a wordplay on the 1963 comedy film, “It’s A Mad, Mad, Mad, Mad World”. “It’s A Man’s Man’s Man’s World” became a staple of Brown’s live shows for the rest of his career. Its slow, simmering groove and declamatory vocal line made it suitable for long, open-ended performances incorporating spoken ruminations on love and loss and sometimes interpolations from other songs. Jimi has been singing his whole life, but it never translated into a breakthrough for him. In the eighties, it still seemed to be possible, until his mother became ill.
“I have taken care of her for at least eight years,” said Jimi in an interview. “I had to choose between taking care of my mother or fame. The choice was an easy one. Your mother always comes first.” And so for nearly a decade, Jimi looked after his mother. 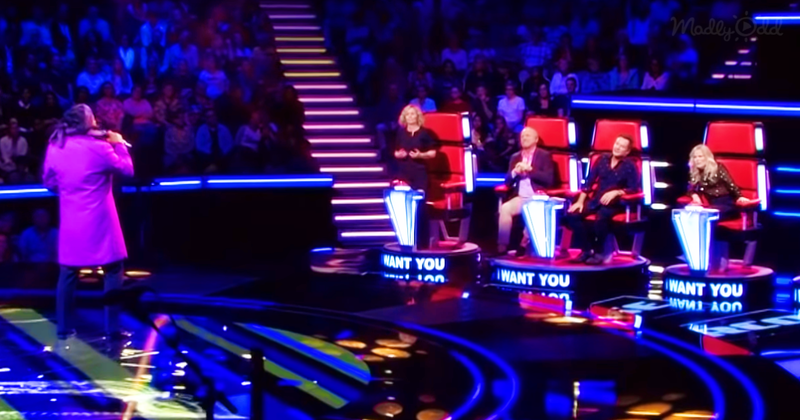 In the closing stages of the show, the singer took on three equally talented competitors: Annet Hesterman (68), Georges Lotze (61) and singer Noble (71), but in the end, the soulful performer was crowned winner and champion of The Voice Senior. Watch Jimi’s incredible rendition of “It’s A Man’s Man’s Man’s World” and you be the judge. Then share this with a good friend. Share Jimi’s performance on “The Voice Senior’ with your friends.